Located in the extreme west of Venezuela, the largely rural frontier state of Tachira is a long way from the urban sprawl of the capital Caracas in more ways than one. For trade, commerce and travel, locals tend to look as much to their neighbours in Colombia as they do to the rest of Venezuela and they have often responded with suspicion to attempts by central government to regulate their affairs. It was here, in the town of San Cristobal, that anti-government protests began in February of 2014 - violent demonstrations, largely over shortages and the government's economic policies that soon spread across the country, leading to the deaths of more than 40 people. Since then, although the protests have waned, the economic crisis in Venezuela has become more acute, just in time for this weekend's congressional elections - arguably the most serious challenge yet to 17 years of socialist revolution launched by the late President Hugo Chavez. So when, just over three months ago, his successor Nicolas Maduro declared a "state of exception" in Tachira and other frontier areas, many locals were outraged. Some saw it as a crude instrument to divert attention away from economic troubles elsewhere and to lay the blame at anyone's door but the government's. Ever since its socialist revolution in 1998, Venezuela has had a frosty relationship with more conservative governments in Colombia. The Maduro administration often accuses Bogota of deliberately trying to destabilise Venezuela and of fomenting "economic warfare". At the heart of the row is oil, specifically petrol. Venezuela has some of the world's biggest oil reserves. Consequently it gives petrol virtually free of charge to its own consumers. But that makes it a very attractive proposition to smugglers looking to make a fat profit in Colombia, where petrol prices are much higher. Hundreds of people were making the journey back and forth across the border every day, making money from the contents of their petrol tanks. So at the end of August the Venezuelan authorities closed the border to all but essential and exceptional travel. And for good measure, it accused the Colombian government of facilitating the illegal trade in cheap Venezuelan fuel. The impact on the economy of Tachira has been significant - but for the thousands of people of Colombian origin living in the border area it was traumatic. 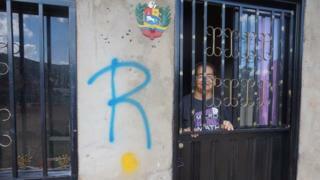 Even though many had been living openly in Tachira for years, they were literally thrown out. Thousands of people fled across the fast moving waters of the Rio Tachira by foot, carrying all their worldly goods on their backs. Symbols were daubed on the walls of their homes by Venezuelan officials in the community known locally as "La Invasion." The letter "R" meant that the house ownership was being reviewed. The letter "D" earmarked a house for demolition if the owner was regarded as an illegal occupant. When I put it to a pro-government, Chavista deputy Nellyver Lugo that enforcing special measures and prohibiting large gatherings in border areas just before an election might be interpreted as undemocratic, she was unrepentant. "Our fascist adversaries have always used tactics like economic warfare to undermine us," said Ms Lugo, a politician known for her uncompromising rhetoric. "But we're convinced that people will see through such move at these elections and we will win this battle, defeating the efforts of the right wing," she continued. If those words seem a touch "over the top", they are not uncommon in an election campaign in which Venezuela's ruling Socialist Party repeatedly warns that the "successes and achievements of the revolution" are at risk from what President Maduro often describes as "capitalist speculators and foreign subversives". When I met the pro-government Governor of Tachira, Jose Vielma Mora, he told me the "state of exception" in the region had been a resounding success - driving down crime and stabilising the local economy. I wondered if the governor, who like many of Venezuela's regional politicians is a former military officer, had seen the huge queues outside virtually every supermarket, pharmacy or automobile-parts shop in San Cristobal. Heading out one morning, we found locals who had been camped out since the early hours, merely in the hope that the supermarket that day might have some basics like eggs, rice or oil. Frustrated with the government's price control policy, which they blamed for the shortages, many were exasperated at how such a potentially rich nation as Venezuela - with its vast oil wealth - could end up in such a mess. It's a mess the government of Nicolas Maduro has repeatedly failed to take responsibility for but which may hand "Chavismo" its first significant electoral setback in Sunday's congressional elections.